I'm working on a 1999 Chevy Tahoe engine code R. I'm doing a 5.7 liter short block rebuild and didn't mark the distributor base before pulling it out. What is the correct alignment when setting the distributor with a cam sensor in it? I was told to set piston number 1 TDC and look inside the distributor for a marking of a number 8 stamped in it and align the rotor to it. I don't have a number 8 but a number 6 stamp in the housing. I tested the crank and cam sensors for voltage in and out, tested okay. Any help would be appreciated. IMPORTANT: Rotate the number 1 cylinder to Top Dead Center (TDC) of the compression stroke. The engine front cover has 2 alignment tabs and the crankshaft balancer has 2 alignment marks (spaced 90° apart) which are used for positioning number 1 piston at Top Dead Center (TDC). With the piston on the compression stroke and at top dead center, the crankshaft balancer alignment mark (1) must align with the engine front cover tab (2) and the crankshaft balancer alignment mark (4) must align with the engine front cover tab (3). Rotate the crankshaft balancer clockwise until the alignment marks on the crankshaft balancer are aligned with the tabs on the engine front cover and the number 1 piston is at top dead center of the compression stroke. Align white paint mark on the bottom stem of the distributor, and the pre-drilled indent hole in the bottom of the gear (3). NOTE: The OBD II ignition system distributor driven gear and rotor may be installed in multiple positions. In order to avoid mistakes, mark the distributor on the following components in order to ensure the same mounting position upon reassembly. Installing the driven gear 180 degrees out of alignment, or locating the rotor in the wrong holes, will cause a no-start condition. Premature engine wear or damage may result. With the gear in this position, the rotor segment should be positioned as shown for a V6 engine (1) or V8 engine (2). The alignment will not be exact. If the driven gear is installed incorrectly, the dimple will be approximately 180 degrees opposite of the rotor segment when the gear is installed in the distributor. Using a long screw driver, align the oil pump drive shaft to the drive tab of the distributor. Guide the distributor into the engine. 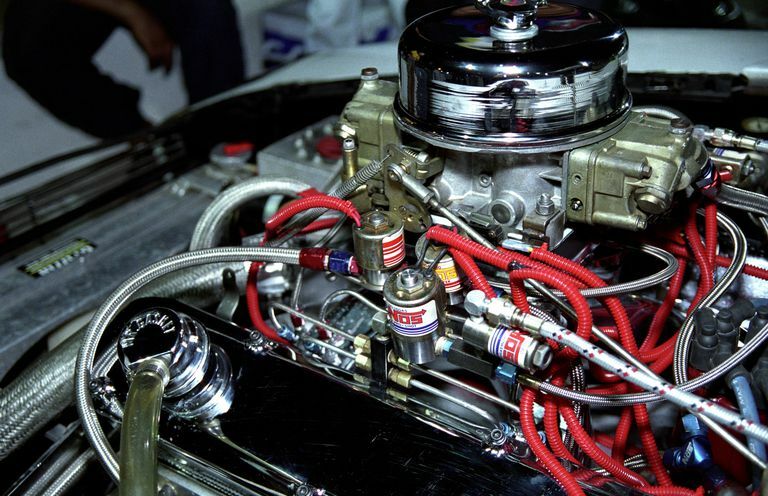 Ensure that the spark plug towers are perpendicular to the centerline of the engine. Once the distributor is fully seated, the rotor segment should be aligned with the pointer cast into the distributor base. This pointer may have a 6 cast into it, indicating that the distributor is to be used on a 6 cylinder engine or a 8 cast into it, indicating that the distributor is to be used on a 8 cylinder engine. If this is the case, repeat the procedure again in order to achieve proper alignment. Install the distributor mounting clamp bolt. Tighten the distributor clamp bolt to 25 N.m (18 lb ft). Install two NEW distributor cap screws. Tighten the screws to 2.4 N.m (21 lb in). Install the electrical connector to the distributor. Install the spark plug wires to the distributor cap. Install the ignition coil wire. The wire must not touch anything like the dip stick. Rubbing will make a ground/short after time of use. For V-8 engines, connect a scan tool. IMPORTANT: If the Malfunction Indicator lamp is turned on after installing the distributor, and a DTC P1345 is found, the distributor has been installed incorrectly. Refer to Installation Procedure 2 for proper distributor installation.